In the UK between 1957 and 1964 Massey Ferguson manufactured some 380,000 MF35s, the most popular medium-sized farm tractors of the period. Many have remained in work and they are a restorer's favourite machine. 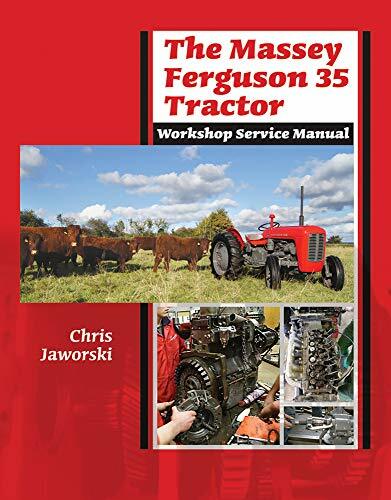 Chris Jaworski's book, based on his heavily illustrated articles for Tractor & Machinery magazine, is a step-by-step manual on servicing and repairing these machines. Whereas the MF company manuals of the period were aimed at dealership mechanics and assumed a great amount of technical knowledge, Chris's book goes back to the basics. The range and quality of his photographs are also far higher than those of the originals from sixty years ago. The main headings of the book are: buying and safety; weekly checks; operator maintenance; engines; cooling systems; fuel systems; transmissions; rear axle and PTO; brakes; hydraulics; steering and front axle; electrics; bodywork. Each section is further sub-divided to take account of the modifications that were applied to the MF35 during its production run and the options available to owners including the De-Luxe variants. For owners involved in servicing, repairs or restoration this crystal-clear guide will help them enjoy getting the work done efficiently. Chris Jaworski is course manager in land-based engineering at Bicton College, Devon. His students' tractor rebuilds for charity are a major feature of tractor shows.